I Have the Most Creative Friends! "I've Got Me Under My Skin"
Next year, I'll run. (Barring some bizarre occurrence such as a big eye floater...) The first ever Ft. Wayne Fort4Fitness Half-Marathon is history and it seems weird that it's over, after all the months of training towards that goal. But I accomplished it, and you can read about my experience of that day here. 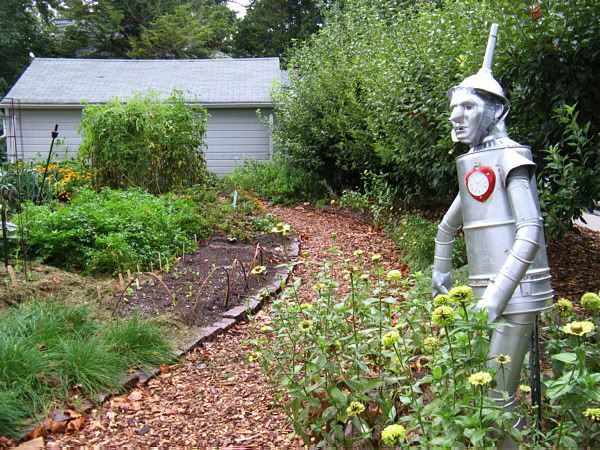 Now, back to my gardens. They miss me. I can tell. 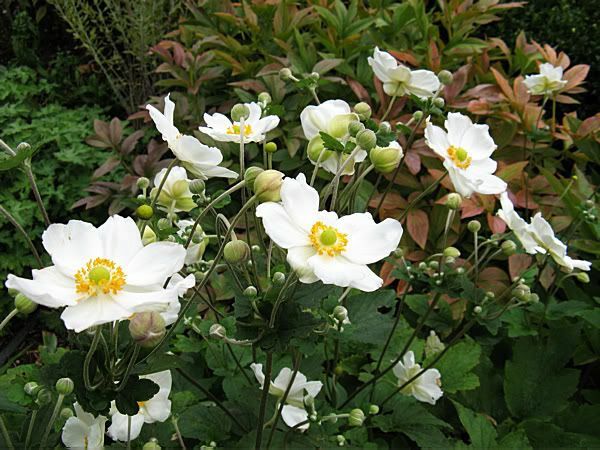 It may be a few more days before I resume gardening, both here on this blog and in the garden. 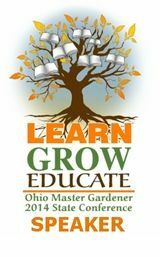 This weekend is The Big Event that I've been training for all spring and summer. 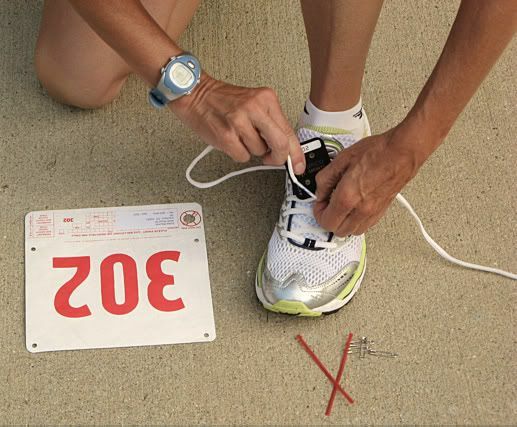 I'm running/walking a half-marathon in Ft. Wayne tomorrow and it will be a busy next three days, because of that and the events surrounding it. 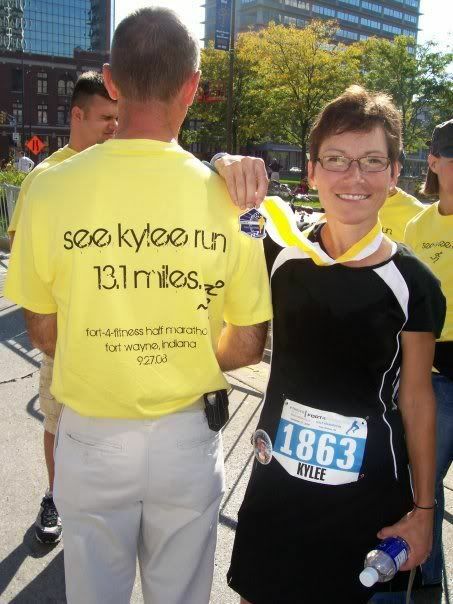 You can read more about my experiences of training for this on my other blog, See Kylee Run. 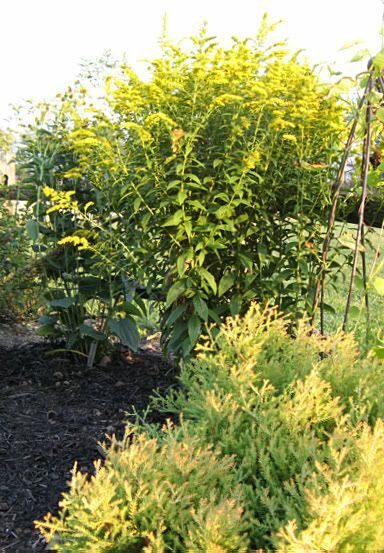 I read Jodi's blog post yesterday and as I strolled through my late September garden in the afternoon, I noticed that my garden wears a lot of yellow right now. Oh, I've got those oranges that Jodi speaks of, but it's the yellows that dominate. Probably no corner shows off its yellows better than the one in Max's Garden where the Goldenrod (Solidago sp.) is in full bloom, behind the golden shrub that Mom gave me a few years ago. I don't know what that one is, but I love the colors it has in every season. And beyond the Solidago is 'Henry Eilers' Rudbeckia. 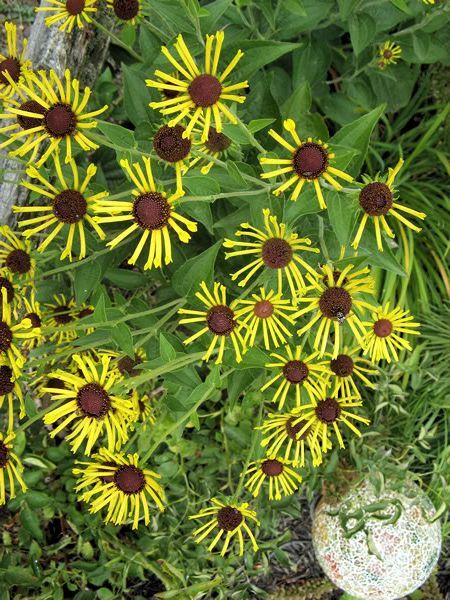 This is my favorite of all the Rudbeckias because of its spiky form. It's the punk rocker of the garden. Around the corner from these is the Giant Yellow Scabiosa (Scabiosa gigantea). Each year, this plant gets more and more lush. It grows taller and the flowers get bigger. I don't know that I would call it yellow though. It's more of a cream color, but I'll include it here because I'm nice that way. 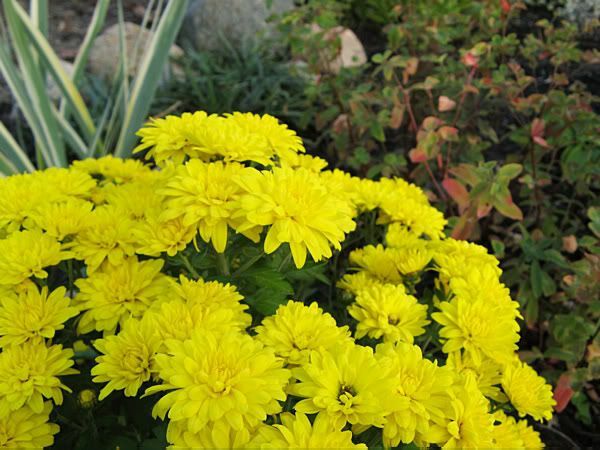 The Chrysanthemum x morifolium 'Golden Helga' is living up to her name, and this is actually one mum that has lived through two winters now. 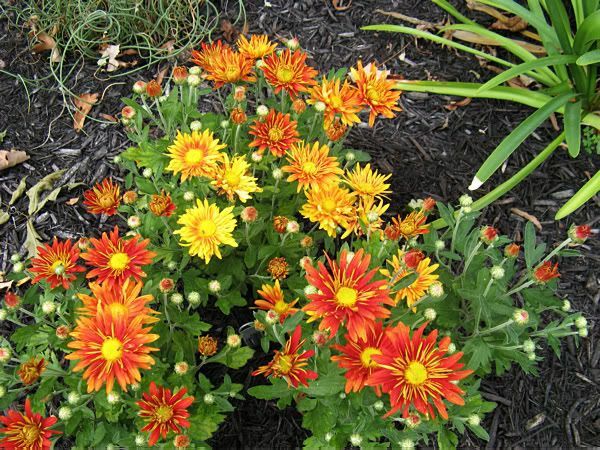 I had a horrible experience with other perennial mums in the Prophet Series not behaving like perennials two springs ago, so I'm a bit leery of planting more. Not leery enough to keep me from buying and planting more, but I'll be crossing my fingers all winter that they'll still be there in the spring. 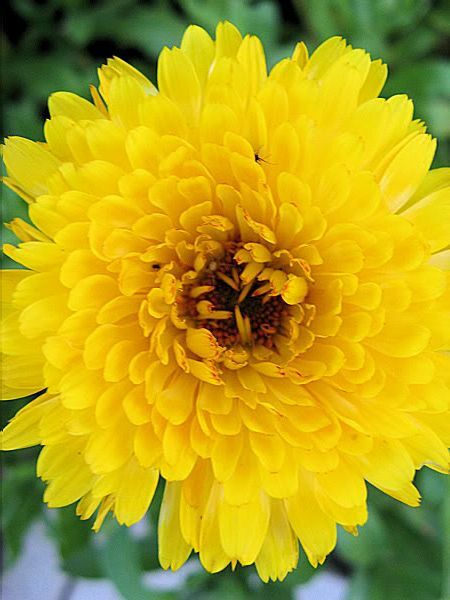 Calendulas just have to be the easiest things to grow. Ever. If I let them self seed, they'd be just as thick next year. 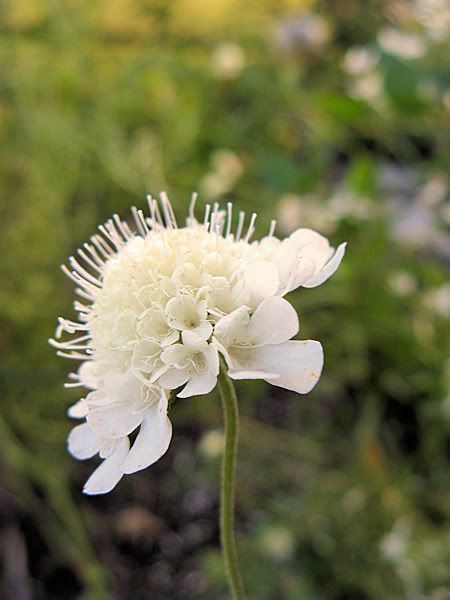 I'll save the seed however, as I do every year, and then toss it on the ground and rough up the soil a bit. Without fail, I get a nice thick crop of it, which is nice to see this time of year. It's just so ... yellow. Near the Calendula is the Tansy. Talk about invasive. 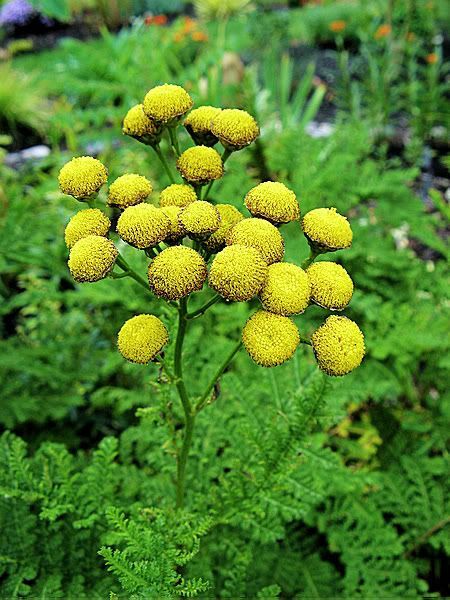 I do love its ferny foliage and its little yellow button flowers, but I don't really want a whole garden of them. So each fall I dig some out so that other things can share its space. Things like the chives. Yeah, that's another one that likes to hog the covers. Maybe I should let them duke it out and see which one wins. 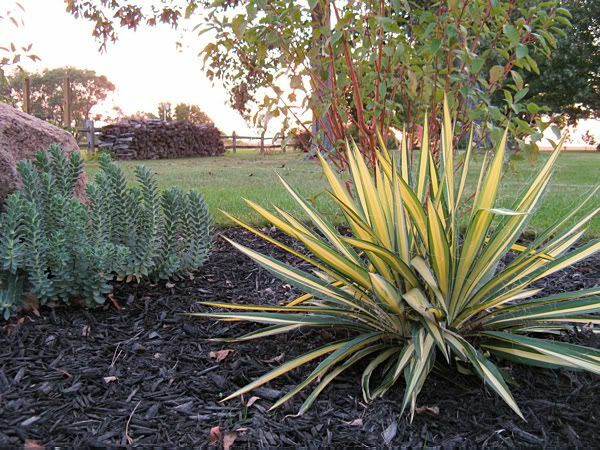 Not really a flower that's yellow, but pretty just the same, is the Yucca filamentosa 'Colorguard'. We've had the green yuccas for years - ever since we moved here in 1977 - but this is the first year for the variegated one. It stayed looking perfect all summer long and I especially appreciate its golden stripes this time of year when the garden is clamoring for color. 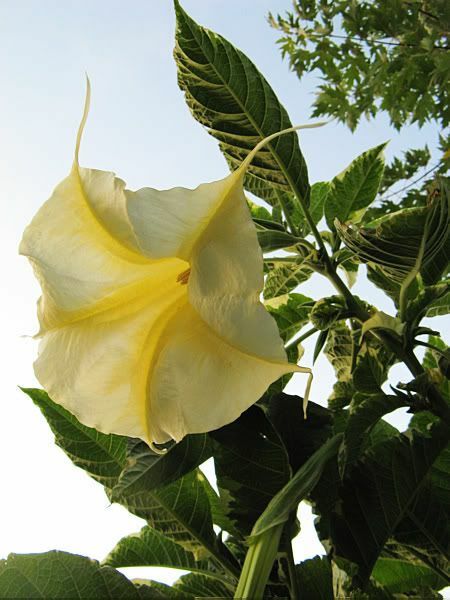 Brugmansia blooms don't last all that long, so when they bloom, I can be found sticking my nose and my camera into its big blooms. In fact, my next-door-neighbor, Tom, found me that way this evening. I asked him if he could smell them as he stood about ten feet away, and he couldn't, so I suggested he come closer. At about three feet, it hit him. He thinks it smells like soap, too. This one was given to me by Mom last year at the end of summer. It's variegated and my best grower. It's reaching "tree" proportions! Summer ended today. 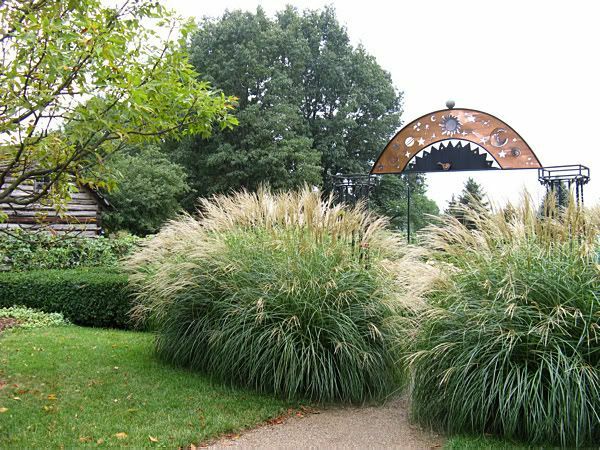 *sniff* As fall has its glorious beginning with our wonderful weather, we'll look at the highlights of the summer garden tomorrow and bid it farewell. So last weekend was my birthday, right? And what would any birthday be without a few surprises? Earlier in the week, I found a package on my front porch that our mail lady had left. I couldn't remember ordering anything, but when I looked at the return address, I smiled, knowing there would be something fun inside. My friend Kat, who lives in Florida, is one of the most artistic, creative people I know. I should have known when I met her that she would be, because she's left-handed and I was told a long time ago that many of the great artists were also left-handed. But anyway, over the years I've known her - which is eleven - I've seen and been the recipient of some of her endeavors. I took the box into the house, and since she knows I won't pay attention to it, she no longer bothers to put on the outside, "Do not open until September 19th" (or Christmas). So I ripped it open and there was an entire box of individually wrapped packages. There were Martha Stewart origami gift boxes, a picture frame, a daisy plate, a wicker pattern ceramic mug, a fun paper number square game she'd made with cute messages inside (remember those? 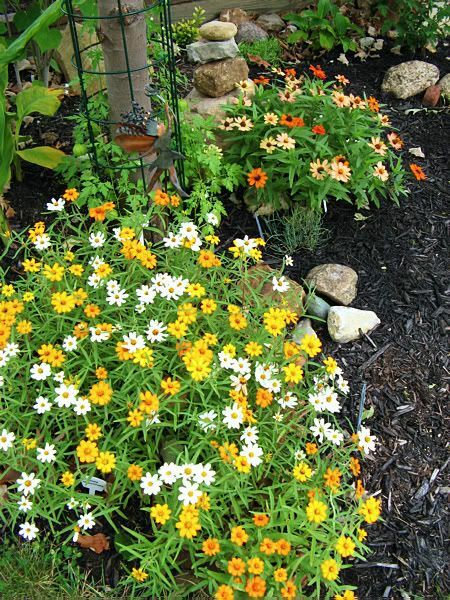 ), a small tapestry pillow that said, "Gardners Know the Best Dirt", and flowers. Flowers! She'd made flowers. Dr. Seuss flowers! 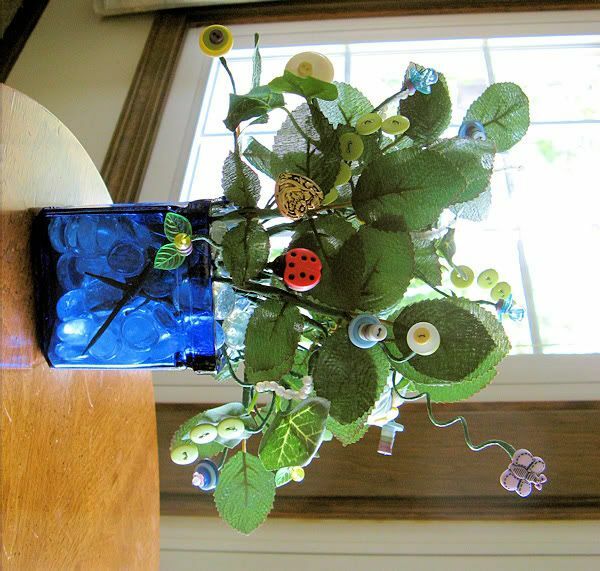 These flowers were made from colored buttons and beads that she'd wired together with silk leaves. She included the wooden picks so I could attach them myself to make the stems whatever length I wanted to. Just too cute. So then, Thursday comes - the day before my birthday. Once again, our mail lady was the deliverer of good things. A padded manila envelope, hand-printed with my address, postmarked from California. 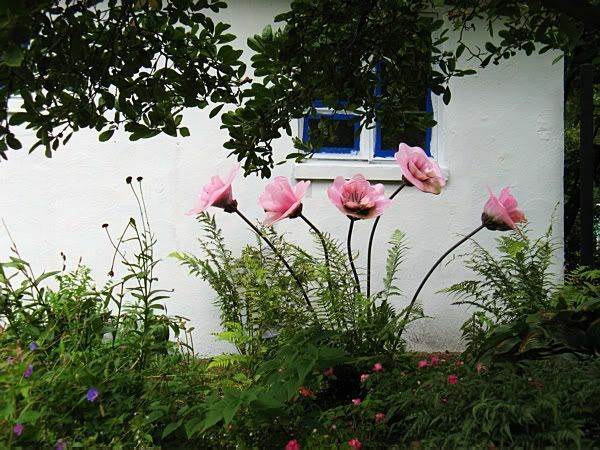 Rosehaven Cottage. Now there's another creative one! Cindy, as many of you know, has great talents in many areas, not the least of which is photography. 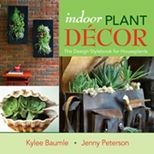 I've admired those talents for about a year now, ever since I discovered her blog, Rosehaven Cottage. 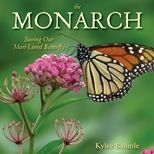 She loves gardening, cats, and nature in general, so we are kindred spirits and I've enjoyed our long-distance friendship. 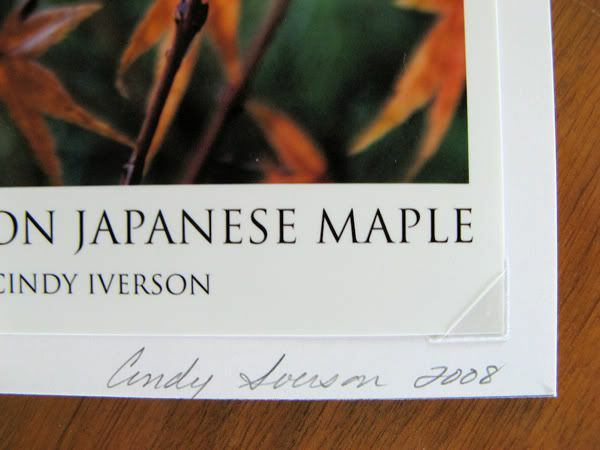 What she'd sent to me was a set of notecards featuring a gorgeous photograph she'd taken of dewsdrops on a Japanese Maple. 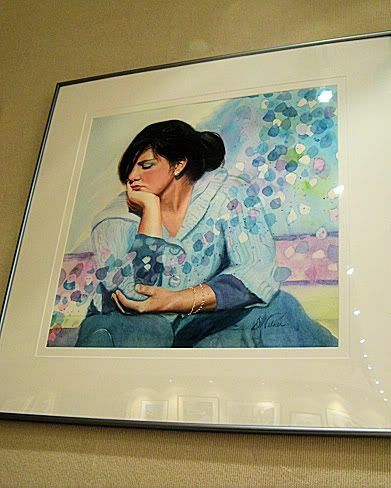 I'd seen the photo on one of her other web sites, Rosehaven Cottage Art Gallery, and commented on how much I loved it. These cards are exceptional. Oh, the photograph itself is outstanding to be sure, but the quality of the print and cards is also first class. She's mounted them using clear photo squares and hand-signs each one. On the back of the card is her personal business information, printed directly onto the card. The envelopes are high quality as well. 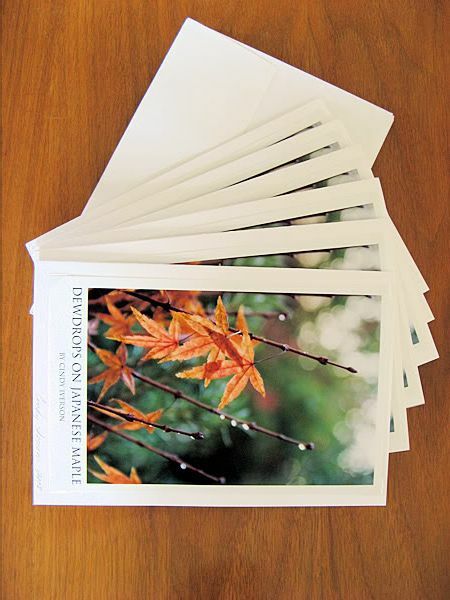 Then they are packaged in a clear cellophane package and sealed with a Rosehaven Cottage sticker. They are a beautiful gift. My birthday is in September and that's when we officially celebrate it. (It was yesterday.) 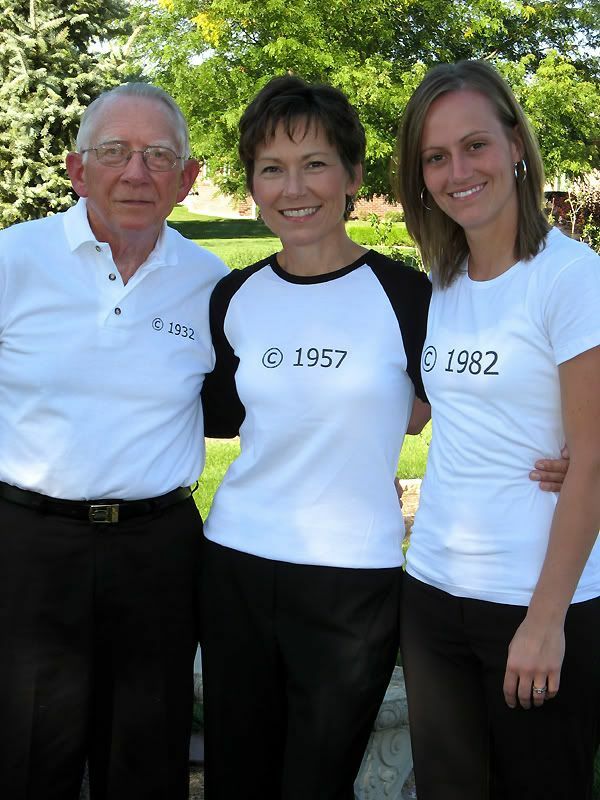 Last year was a milestone for me, as well as our younger daughter and my dad. Mom had a big party to celebrate our 25th, 50th, and 75th birthdays. Since it's Romie's mission in life to keep me happy, I usually announce what it is I want for my birthday well ahead of time so he can do what a good husband does - buy it. Okay, it's not really like that exactly, but almost. We don't make a big deal out of birthdays, so if there's something kind of big or special that we're wanting and a birthday, anniversary or Christmas is close, we get it and say it's for whatever one of those holidays we're celebrating next. 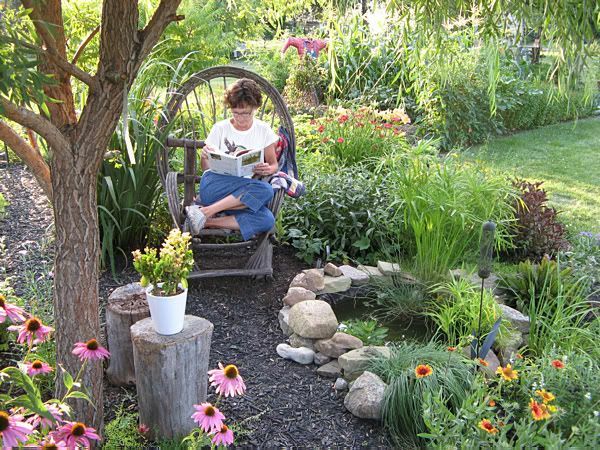 I've been wanting a willow chair for the garden for some time now, but any that I've found online are either too expensive or become that way once you add the shipping charges. It's not that they aren't worth the price they're asking, it's just that I keep hoping to find one that is a little more affordable. Well, one Monday back in July was my lucky day. On the way to Hocking Hills, I was telling Mom how I wanted a willow chair and she said she'd seen a couple of them - get this - in Van Wert. One of the antique stores there had them. So the day after we returned from our trip, Romie and I stopped in to see them. Ah, yes, just what I wanted! And affordable. The tag said $159. We sat in them, we walked all around them, we compared the two. We decided to browse the store for awhile before making a decision, and found something else we'd been looking for - an adze. We'd been using Dad's for removing sod, but we kept needing it at the same time Dad did, so we found one and bought it. As we made our way back to the front of the store to the willow chairs, the sales clerk said she had just talked with the consignor who said she would take 15% off the cost. Well. That sealed the deal, even though we would have bought it at the original price. We chose which one we wanted, paid for it, and packed it in the back of the van. Once we got it home, I ended up putting it in not quite the same spot I'd planned. 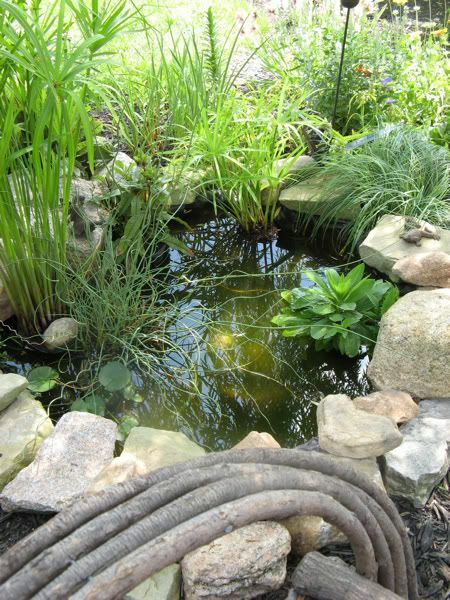 Instead of placing it across from the pond, I put it beside the pond. It just looked better there. 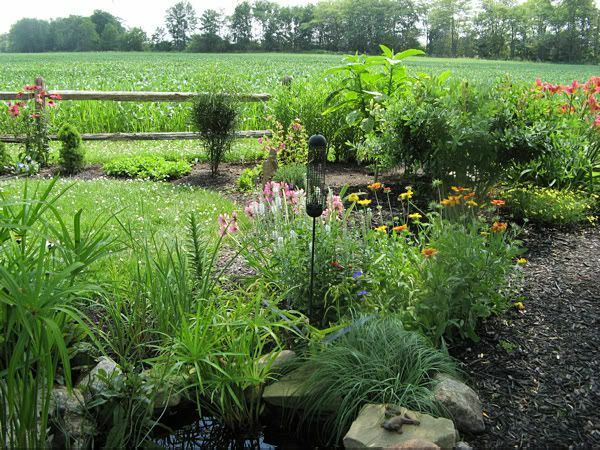 And the garden looks better from there, too. Note: These photos were taken in late July. I only wish my garden still looked like this in September! 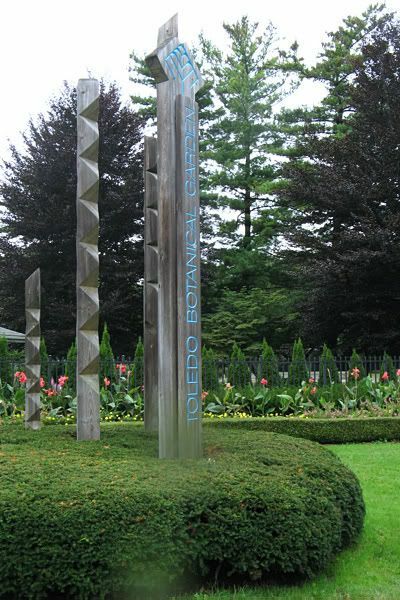 It was the first time that either Marsha or I had been to the Toledo Botanical Garden and we didn't let the light drizzle that fell off and on all day to put a damper on things. We'd brought our umbrellas, but it wasn't enough for us to really need them. 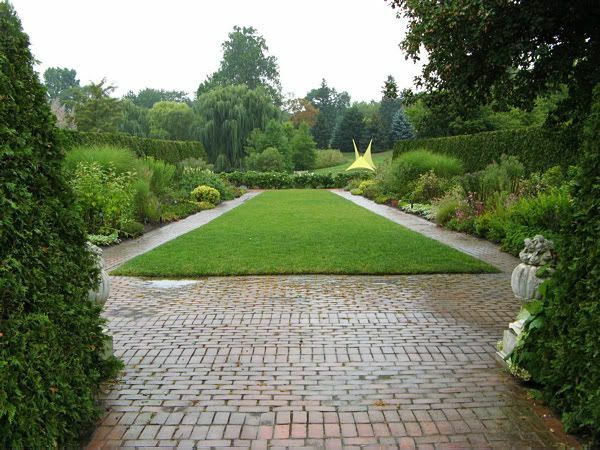 We took our time strolling through the gardens, which are located on over 60 acres on the west side of Toledo. We decided to visit the gift shop first, since we were late in arriving and the shop would close at 5:00. 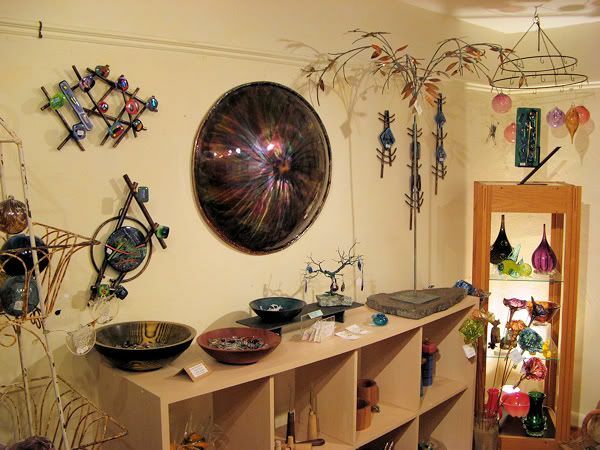 It has many unique items, with one room devoted to beautiful and unusual glass items, some of which were Chihuly-esque. 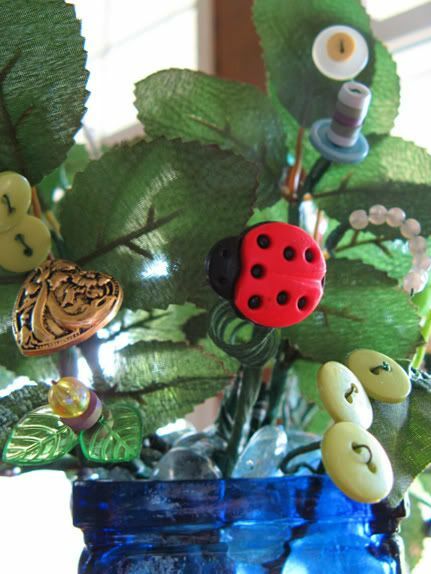 I chose a small glass bird made by an artist from Switzerland that will hang in my kitchen window. There were plants for sale as well, at a 40% discount, and I purchased the two remaining hardy Agapanthus. At six dollars each and with multiple bulbs in each pot, these were a bargain and I won't have to lift them for winter like I have to do with the ones presently in my garden. We stashed our treasures in the car and then made our way to the gardens themselves. 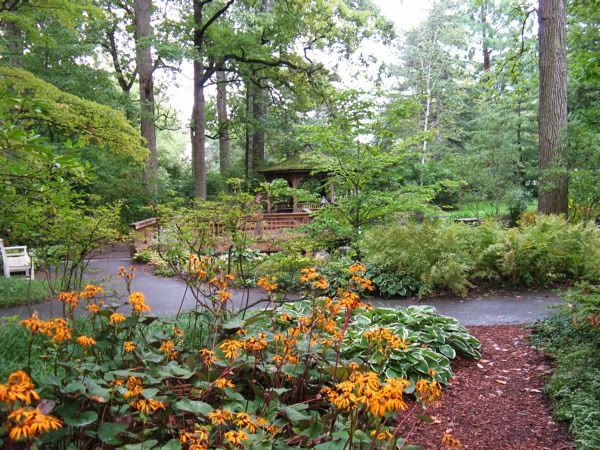 On a warmer, sunnier day, the Shade Garden would be a soothing haven, with its lush green trees, shrubs, and small pond with an gazebo overlooking it. 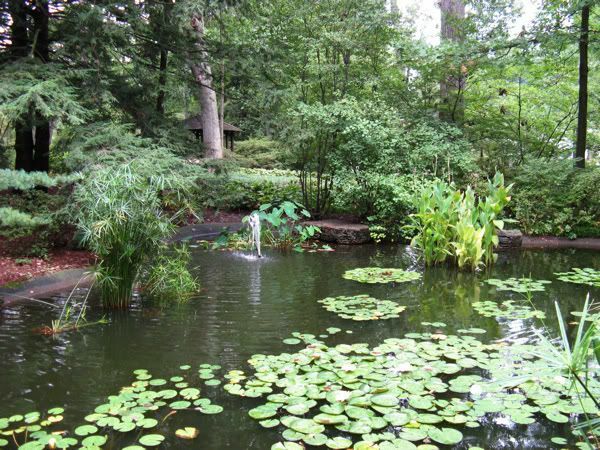 Within the shade garden, by the gazebo, is the Aquatic Garden. 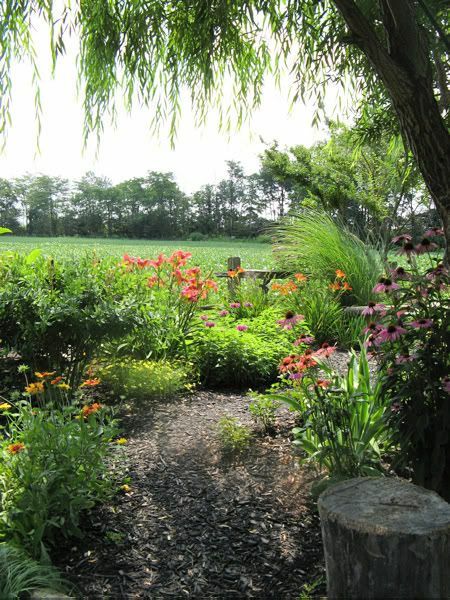 There was a grotto sitting area and many, many hostas, those staples of any shade garden worth its salt. 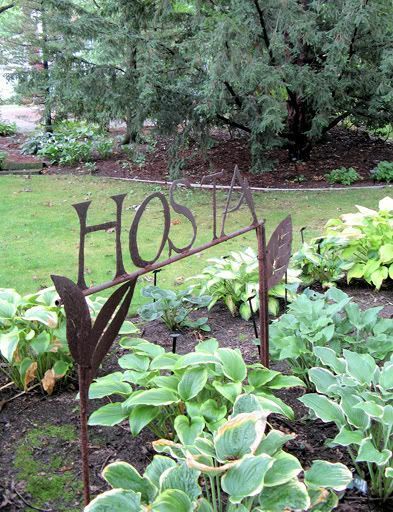 The Hosta Collection here is accredited by the North American Plants Collection Consortium (NAPCC). On our way to other parts of the gardens, we decided to take a detour to one of the other buildings on the property. This one housed art on display, some of which was for sale. 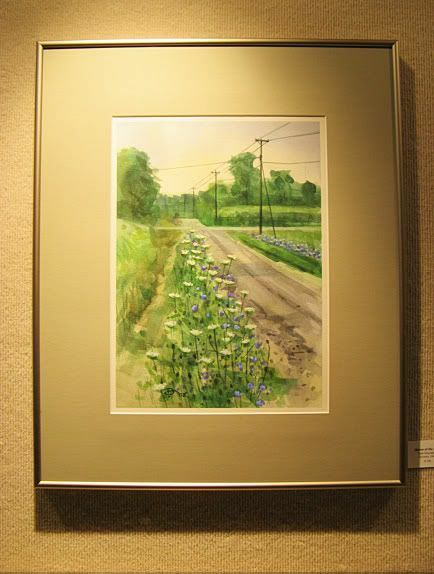 Most of them were watercolors (my favorite medium) and there were a couple that I thought were exceptional. 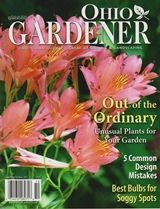 Returning to the gardens, we visited the Pioneer Garden, which grew heirloom plants, plus a few unusual varieties, such as tobacco and cotton. 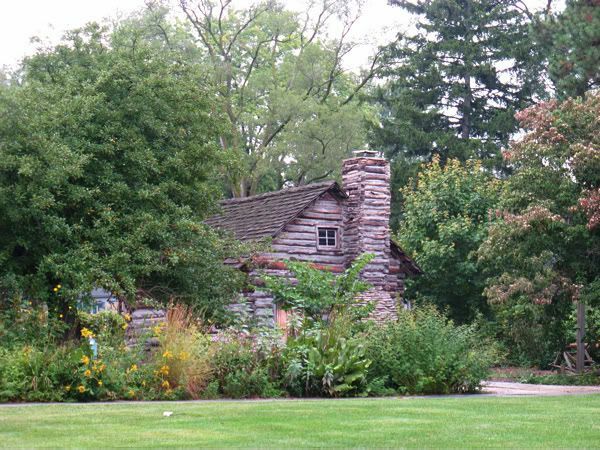 The log cabin is authentic, moved from its original location to the gardens, and was inhabited by Peter Navarre, thought to be one of Toledo's first inhabitants. The large apple tree by the cabin is believed to have been planted by Johnny Appleseed. 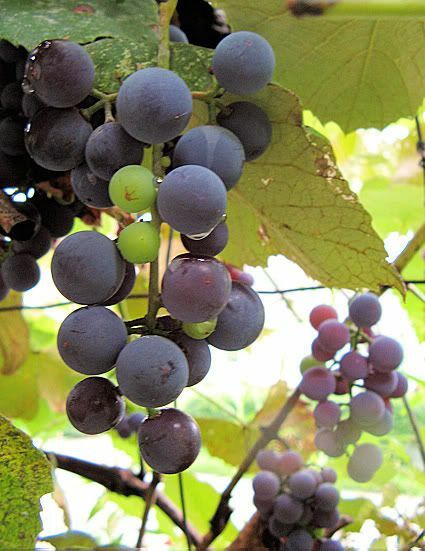 There was a long fence lined with grapes that were ripe for the picking. Marsha and I both had a taste and I have to say they were the sweetest I've ever had. Maybe seeded Concord? 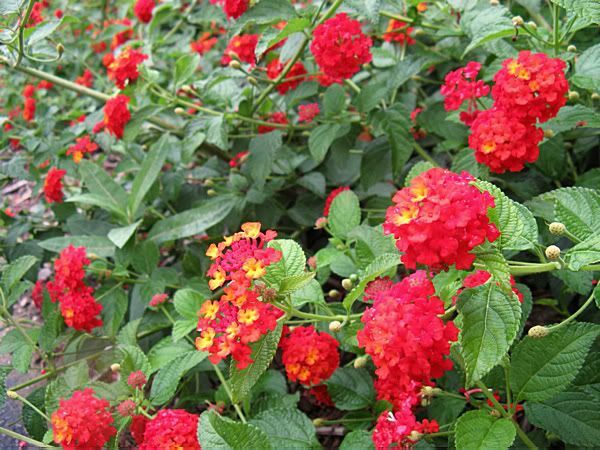 Below the grapes was a long row of Lantana in the most luscious shades of red and orange. I have pink and yellow Lantana in window boxes at the front of my house and I wish they were hardy here. I think I'll try to overwinter them. 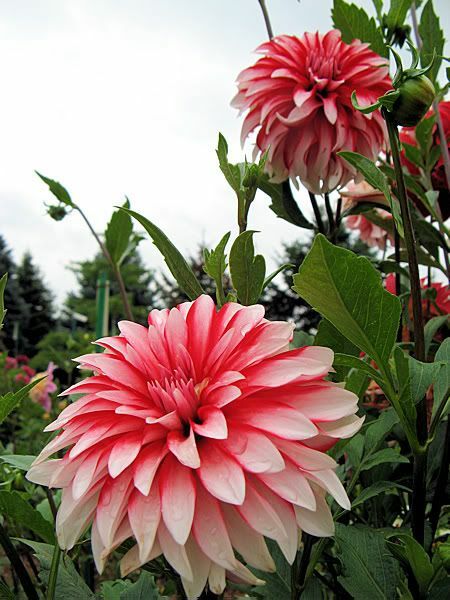 Nearby was the Dahlia Display Garden which showcased many varieties and colors of dahlias, all of which were on plants nearly six feet tall. The entrance to the Rose Garden was impressive and so lush that you really couldn't tell what laid beyond. The grasses there gave no indication that beds of roses were behind them and we were somewhat surprised to walk through and find so many still in bloom. 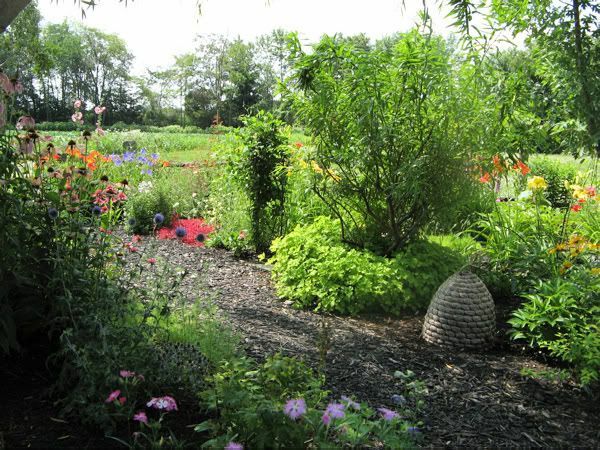 Just behind the Rose Garden was the Vegetable Garden, which utilizes the French Intensive Wide Bed method. There wasn't much yet left for harvesting, except for the tomatoes, much as it is in my own garden. But I'm sure it looked fabulous in July! The Tin Man was an interesting touch. 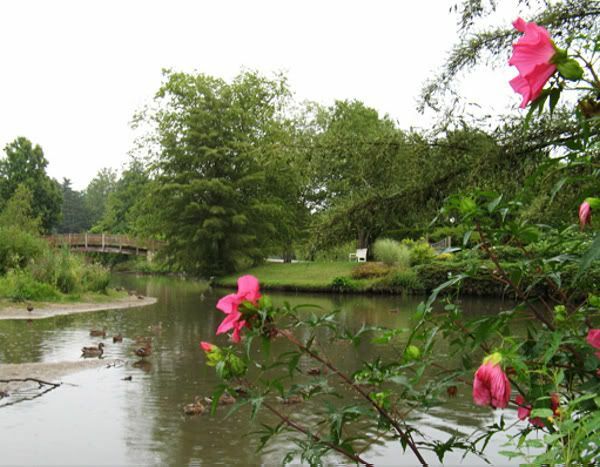 We walked over one of the bridges over Crosby Lake, to the Perennial Garden, which is divided into sections such as the Color Garden, the Grass Garden, the Green Garden, and the Cottage Garden. In the midst of these is the English Border. 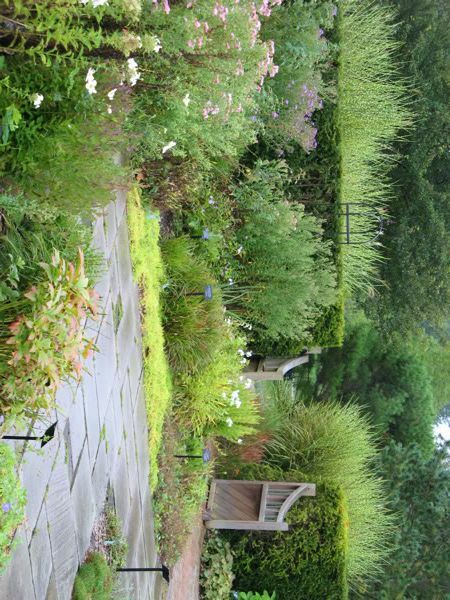 Everything was so well-kept, we remarked about how many people and man-hours it must take to keep a garden this large looking this good, especially during a summer with drought conditions that we've had this year. 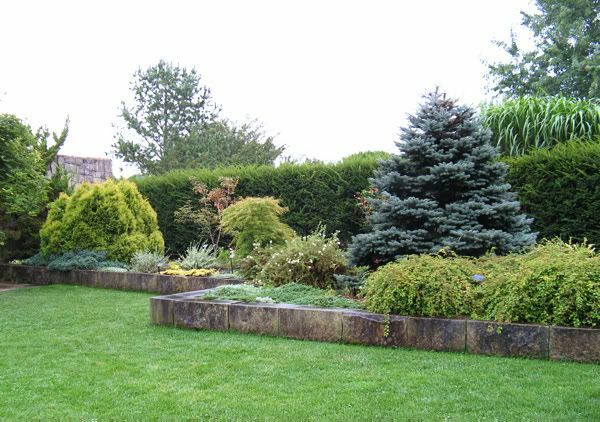 The Green Garden was mostly in large raised beds and contained various types of trees and shrubs. 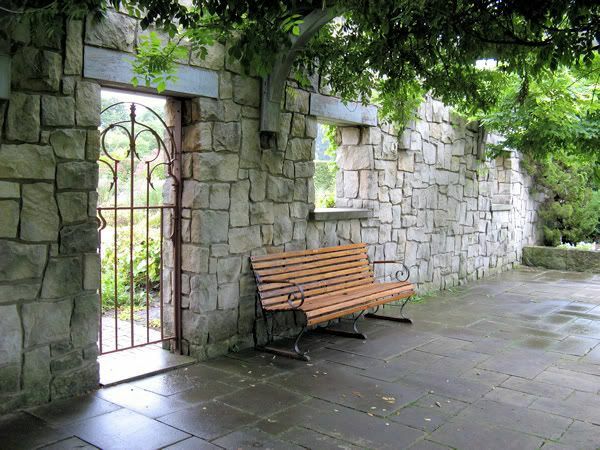 My favorite part of the Cottage Garden was the stone wall, which provided a very romantic setting that would have been beautiful for a wedding. And speaking of weddings, there were preparations going on for one on the grounds later that evening. The 'getaway' vehicle was parked there and even with the windows up on the car, you could smell the age of it. 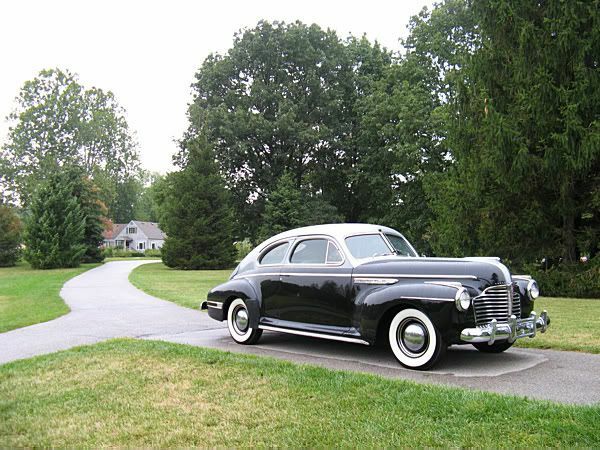 It was a Buick Eight 'Special' and in immaculate condition. 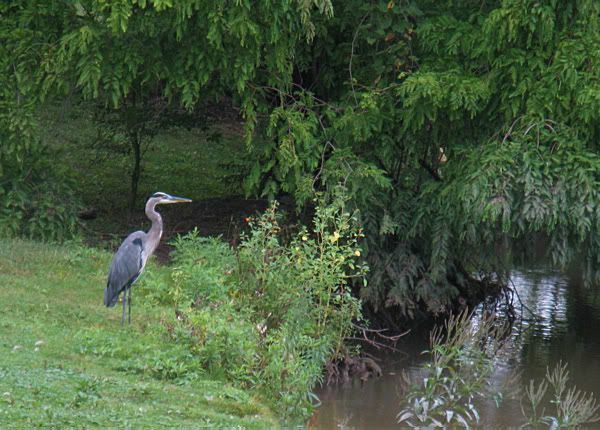 There is a resident Great Blue Heron on the grounds, which we were fortunate enough to see. 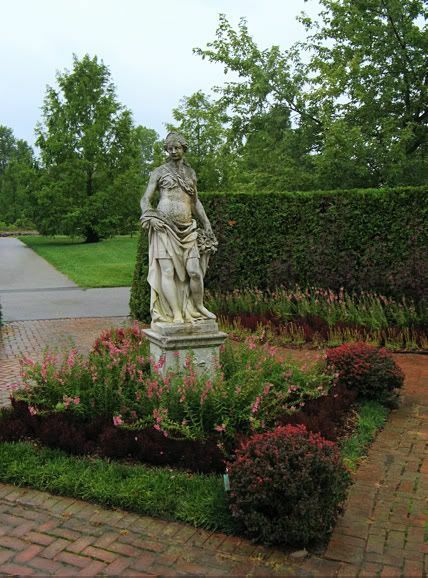 Art is an important part of the gardens and their mission. 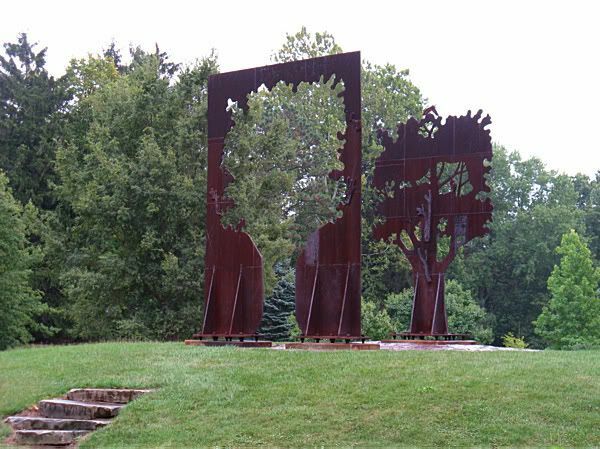 Grants from the Ohio Arts Council make much of the art that is present here possible. The Blair Museum of Lithophanes is on site and we would have loved to have seen that, but it wasn't open the day we were there. 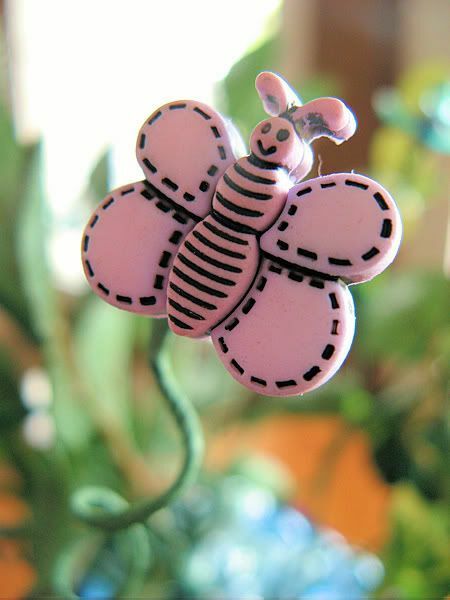 Like the large pink flowers? They're glass! but we'll see if they are still there next spring. 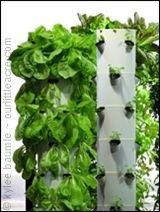 Somehow, we missed the Herb Garden. This means a return trip - as if we need an excuse to make our way back to this beautiful place. I'd like to see it in late spring/early summer, when the azaleas are in bloom. I'd like to see it in all its seasons and with it only being an hour and a half away, it's a possibility! Where DID the summer go? It seems like just a couple of weeks ago, I was hustling to get August Garden Blogger's Bloom Day photos posted! 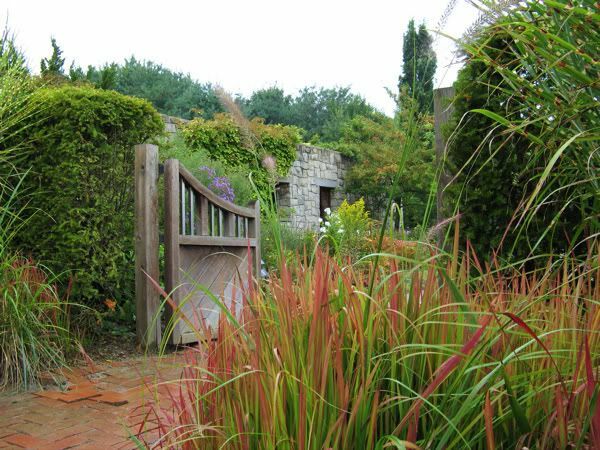 However long ago it was, there's no doubt about it now - we're beginning to experience fall in the garden. I've begun some cleaning up. I can't stand the crispy brown leaves on the lower parts of some of the annuals, so they've been pulled out. With the hot dry weather we've had for so long, powdery mildew has also been a problem with some of them. But we got lucky and got three inches of rain over the weekend, the first we'd gotten in about two months! In spite of all that, there are plants that are just coming into their own. 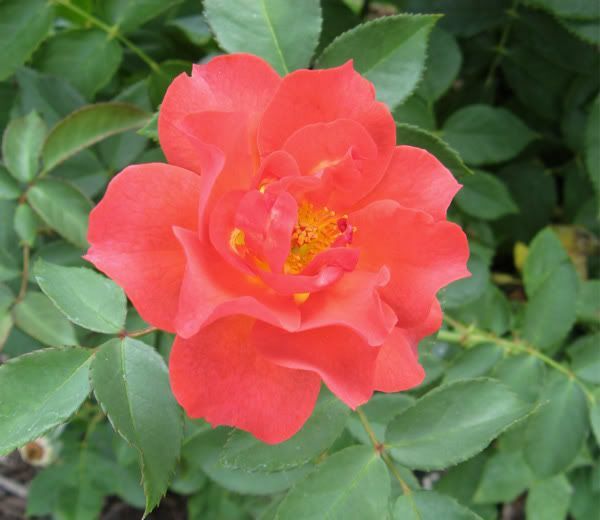 The mums are beginning to show color, the toad lilies are opening, and one of the new roses I bought this year - 'Cinco de Mayo' - is screaming for attention with its new flush of blooms. 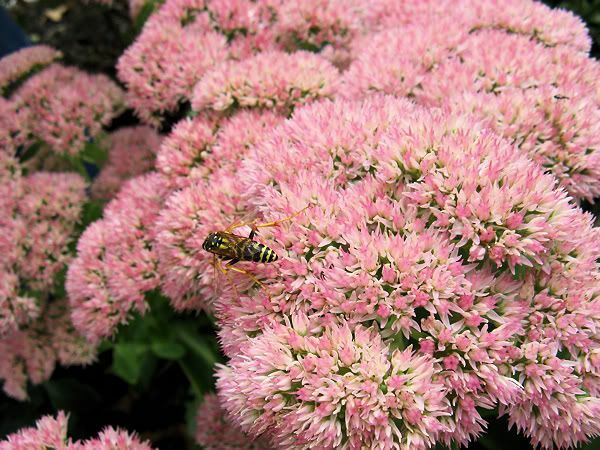 The various sedums have been blooming, with 'Autumn Joy' and 'Autumn Fire' being the stars at the moment. Zinnia 'Profusion Apricot and Fire' behind them. 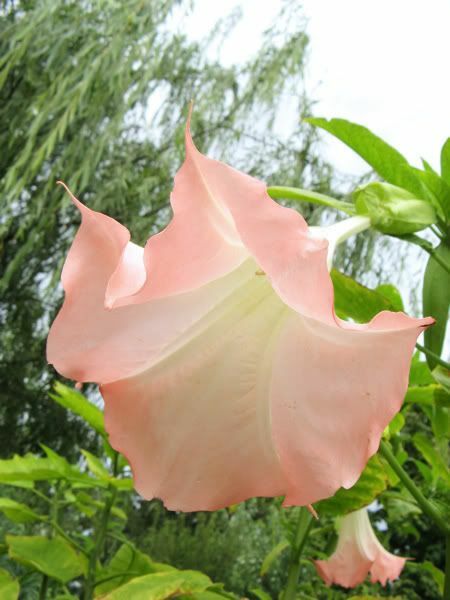 The brugmansias have been throwing out their huge and fragrant blooms since late August. 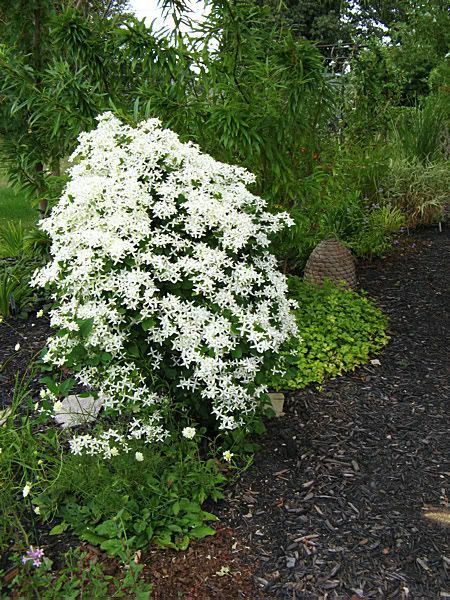 Sweet Autumn Clematis is in full bloom and smells wonderful as I walk through the arbor it covers, up by the house and also the trellis out in Max's Garden. The fragrance is more intense in the evening. 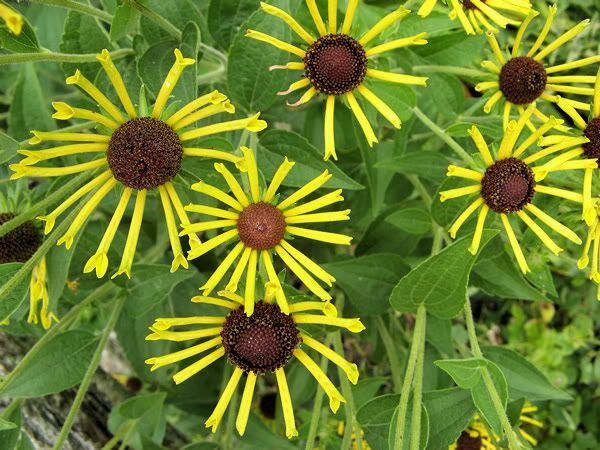 Rudbeckia 'Henry Eilers' is a vigorous grower and bloomer and I love its unusual spiky petals. I'd tried to grow these from seed last year and had 0% germination rate. This year, I got plants from Great Garden Plants and they grew like gangbusters in spite of the hot, dry weather we've had. 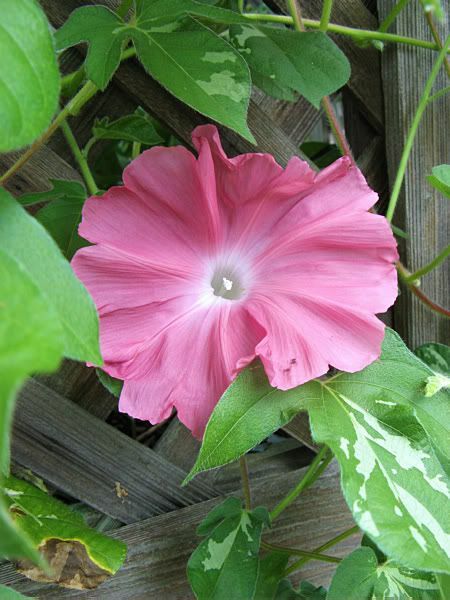 After their usual slow start, the morning glories are growing and blooming like there's no tomorrow. 'Chocolate' threatens to take over the gazebo. 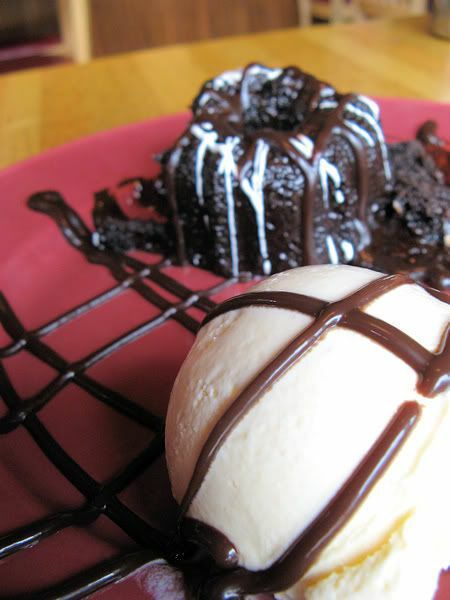 "Death by Chocolate" - what a way to go! LOL. 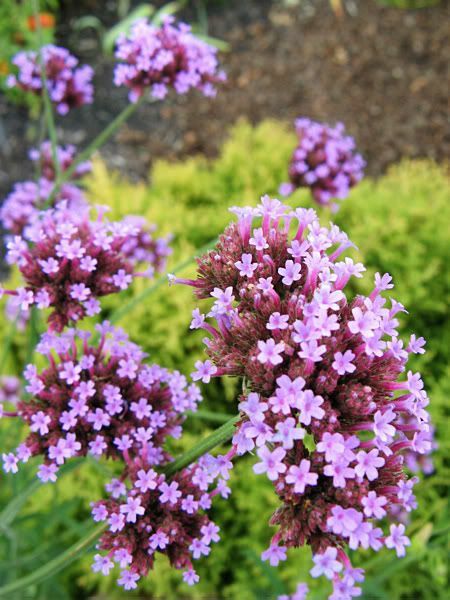 I grew Verbena bonariensis for the first time this year, by seed. I'd read about it on so many other blogs and how everyone loves it. Now I know why they do. The strong, tall stems with the purple clusters of flowers at the top look great at the back of the garden by the fence. 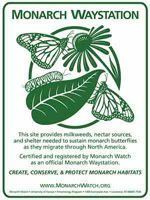 It's a favorite of the butterflies, bees, and hummingbirds, too. I've heard that it self-seeds - I hope so! 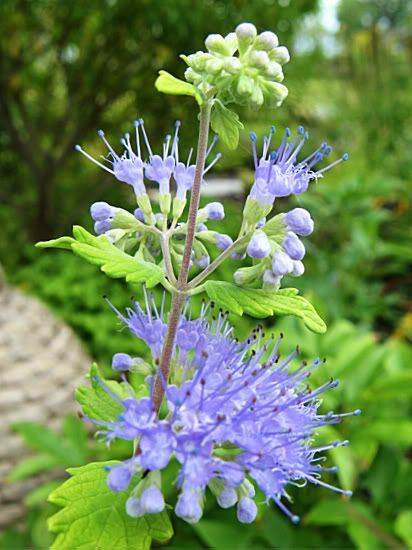 Caryopteris incana 'Sunshine Blue' is starting to bloom now. It was just planted this spring, as a replacement for 'Dark Knight' that didn't make it through the winter. This one has grown quite a bit since planting and I'm hoping its vigor will carry it through the winter. Until I planted these delphiniums (Delphinium elatum 'Magic Fountain') last year, I had terrible luck growing them. 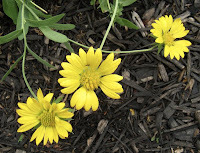 These even self-seed for me and we've enjoyed their blooms all summer long. 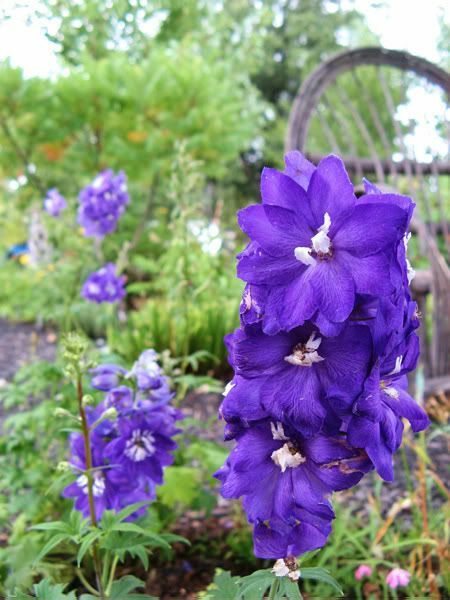 Whatever the secret is to growing delphiniums successfully, I've stumbled upon it and I don't even know what it is. Sometimes it's best not to ask and merely enjoy! Second only to the mums, nothing says fall like asters. 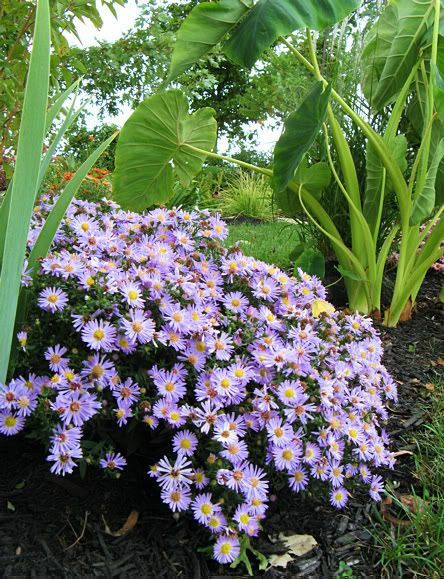 I have more luck with them wintering over here, so I've been looking to add more asters to the garden for fall color. This one is Aster cordifolius 'Wood's Blue' and as you can see, is covered with blooms! 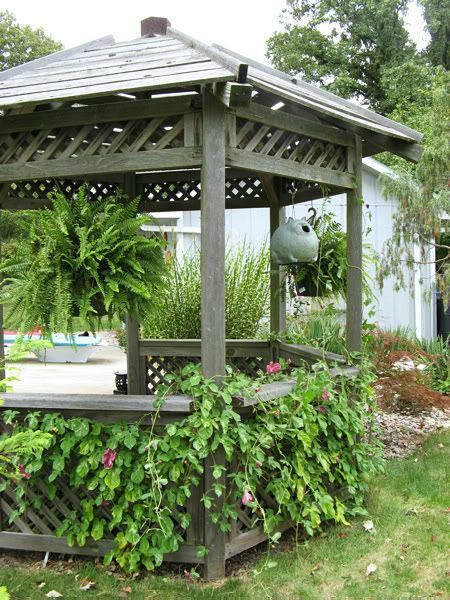 The patio is covered by the pergola, so it's quite shady. There is a stone table with two benches and I've got an ironworks basket of sorts, sitting on the table. 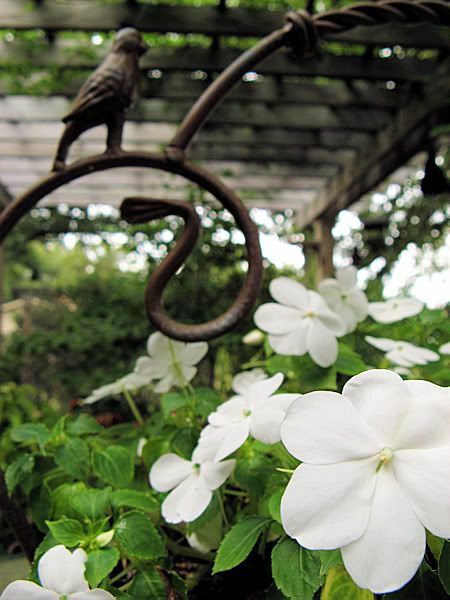 This year, I planted white impatiens and a Japanese painted fern in it and there has been an abundance of pristine white blooms all summer. There are many other blooms, thankfully, so the season isn't over yet. We have all of fall to enjoy, with its deep blue skies, crisp air, and changing colors. It's one of the best parts of living in the Midwest.